Since releasing Harry the Moustache I have received a couple of comments from people mentioning that he would do well as a stuffed animal on Etsy or even wholesale in stores. These comments made me think more about whether I want to go that route or not – but in the end I decided to stick with my original plan and not sell finished stuffed animals. From the get go I knew I wanted to design patterns and not sell already completed items. I had been listening to podcasts about other designers who often started off selling their finished crocheted projects, but then switched to only selling patterns. The reason for this change? Most often it was because they got tired of making the same thing over and over again. When I crochet, I like making one item from a pattern and then move on and try a completely different one, a pattern from which I can learn something new – and I knew I would be the same with my designs. While I love my patterns and will be making more stuffed animals from them for friends and family, I do not want to make a ton of Harry’s all the time! Another reason people often switch to designing patterns is that once the pattern is out there, you can make multiple sales on that one pattern without having to do much else (besides provide customer support). Yes, there is a lot more work that goes into designing a pattern than crocheting a finished stuffed animal, but in the end I think it is more efficient to make the pattern. While these reasons are great and a large part of why I don’t make finished projects, there is another reason I am hesitant to crochet and sell stuffed animals: I want my patterns to inspire people to pick up a hook and learn how to crochet themselves, not take out their wallet to buy what I have already made. I want people to experience making a cute plush themselves, seeing how their creation comes to life when the face is complete, and then either admiring their work within their home, or giving it to someone else as a gift knowing they had made it themselves. I think anyone can learn to crochet, and if you are making something you think is adorable, it makes it that much easier and more fun! I am not saying that you should never buy handmade goods, because I buy them myself, but I think in this case, with these amigurumi in particular, making one yourself isn’t that tricky if you really want one. 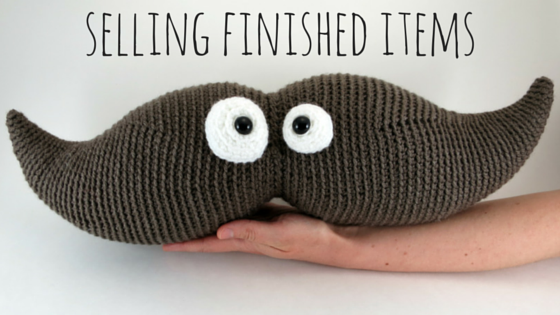 There isn’t any crazy equipment or artistic skill needed, just a hook, yarn, stuffing and a bit of time. As my husband likes to say, “you can make that“, and I want others to be inspired to make things, too! I try very hard to make my patterns uncomplicated and easy to follow so that no one is frustrated with crocheting their amigurumi. I want people to truly enjoy the experience. It is my hope that people won’t give up when making their animal (or moustache) because they are confused or maybe don’t like assembling and attaching all the pieces. I want people to enjoy the experience from beginning to end – so if you don’t, let me know, because I want to help! “You can make that” is often heard in my house too. I like to buy home made, but usually stick to things I know I could make, but never would or something I have tried in the past and not enjoyed the process. I do however, really appreciate when people take the time to make the pattern so I can enjoy the creating experience. Yes, this is true! There are times when I may want to buy something because I know I don’t enjoy the process of making it myself. Everyone has their preferences, you just have to discover them for yourself by experimenting!